Kamakura is among the most popular destinations for day-tripping Tokyoites, who regularly fill up the city’s historic temples and meander through its beautiful shrines on weekends and holidays. For Hajime Takano, such a trip was his birthday wish when he turned 53 earlier this year. But the prospect of his wish coming true seemed like a long shot. That’s because he has amyotrophic lateral sclerosis (ALS). Having been diagnosed five years ago, the progressive and incurable neurological disease has degraded his ability to move, speak, breathe and eat, while leaving his consciousness and higher mental faculties intact. Enter Tomoya Takano (no relation to Hajime Takano), the owner of a barrier-free guesthouse in the Kanagawa Prefecture city, which lies about 50 kilometers south of Tokyo. Hajime Takano grew close to Tomoya Takano through the latter’s crowdfunding project last year, which secured the money for the opening of the guesthouse. Once Hajime Takano learned that his birthday wish was in line with what the 31-year-old was hoping to accomplish, they began working together to design a package tour of the area for people with disabilities. The tour makes use of drone technology and Tomoya Takano’s comprehensive knowledge of wheelchair-accessible locations in the Kamakura area in order to maximize the experience for participants. Hajime Takano’s birthday wish was realized when he took part in a trial run of the tour on Oct. 14. 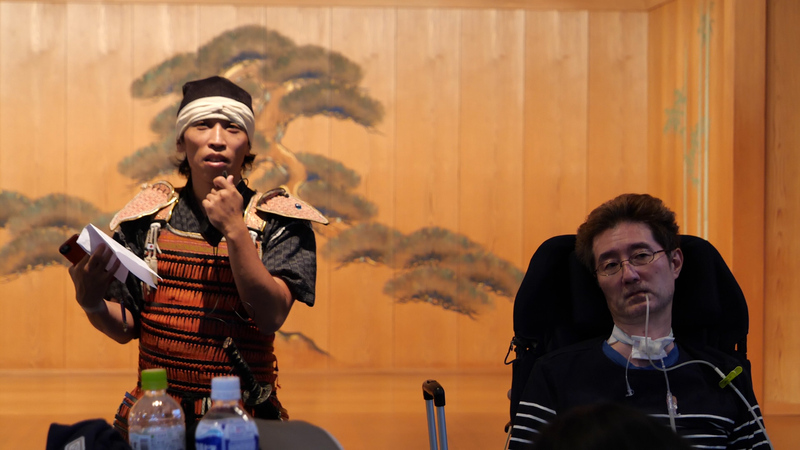 The guesthouse owner, nicknamed Bushi (samurai warrior) because he wears suits of samurai armor on a daily basis, will officially launch the Kamakura tour for people with disabilities in spring 2019. To make it possible for people with ALS or other serious disabilities to enjoy the tour as safely as those without disabilities, Bushi, Takano and supporting staff members went through a full-scale rehearsal during which they measured the size of entrance gates to determine whether wheelchairs would fit. They also checked the locations of any uneven roads and pathways that might cause access problems. Visiting intended destinations in advance is normally imperative for the families of people with ALS, especially those in the advanced stages of the disease, as traveling on uneven terrain could loosen and even possibly detach the patient’s throat-mounted artificial respirator. Furthermore, the specially equipped wheelchairs used by people with ALS, which are normally bigger and heavier than regular wheelchairs, often do not fit into regular-size elevators. 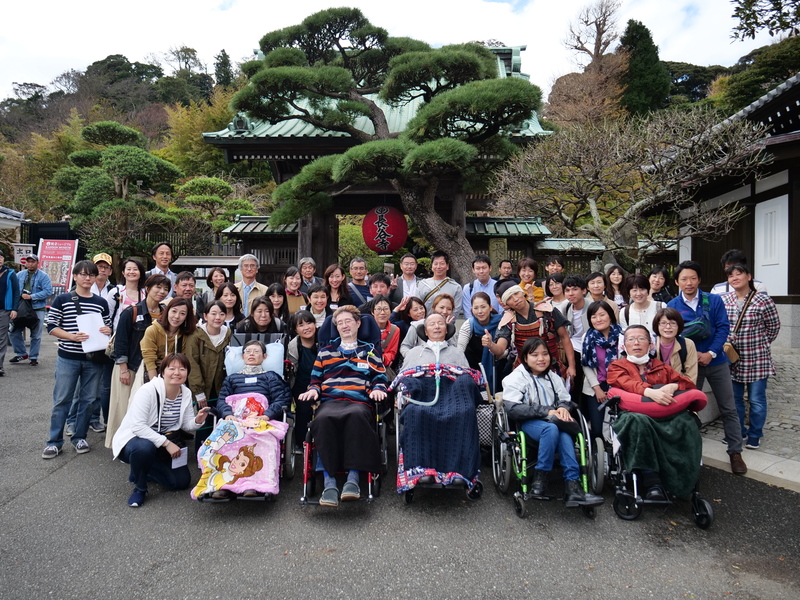 During the rehearsal tour, seven people with ALS and other neurodegenerative diseases visited Hase Temple and the Great Buddha of Kamakura, along with about 50 other participants including family members, friends and medical assistants. Naomi Ishibashi, who joined the tour along with her sister to support their father, who also has ALS, said this type of package tour has the potential to minimize risk and alleviate stress for family members of those with disabilities. After realizing that many of the pathways to the most scenic spots were too narrow for wheelchairs, Takano and Bushi came up with a novel alternative — live-streaming video through the use of a drone. 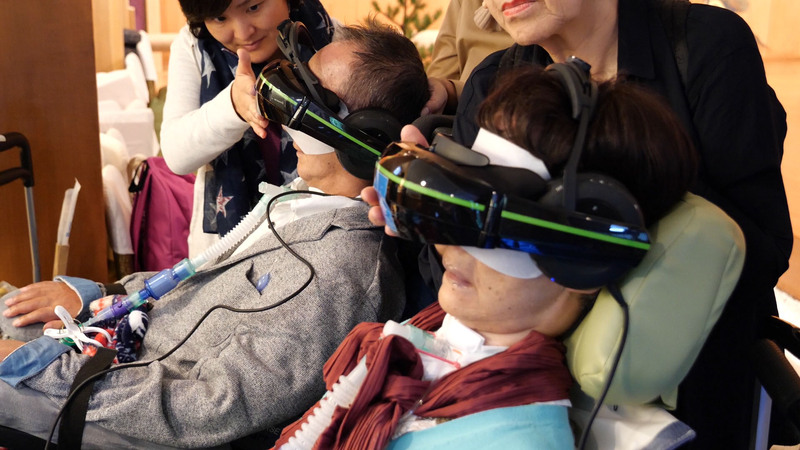 In collaboration with drone-maker Sian Aviation Inc., tour participants donned virtual reality headsets and earphones to watch a live video feed of the inaccessible Kamakura temples and Yuigahama Beach. For one individual with ALS who could not make it on the tour, the online video was provided to him to help him feel like he was there and exploring the town with everyone else. Bushi’s passionate desire to assist people with disabilities is rooted in his experiences growing up with a longtime friend who suffered from spinal muscular atrophy. “One day my friend said he wanted to have a girlfriend, so I started hosting a blind date event called ‘universal blind date’ where anyone, including people with disabilities, could participate without hesitation,” Bushi explained. The event has been held 27 times in places in Kamakura and has helped set up 10 couples. But Bushi’s ambition was to provide not just a place for couples to meet but also an experience for them to share together. His “Going to Kamakura with Bushi” tour will be sponsored by the Japan Tourism Agency, which is aiming to promote barrier-free tourism ahead of the 2020 Olympics and Paralympics. On the tour, he will be joined by people with disabilities who will also serve as assistant guides in order to prepare them to host expeditions in which anyone can participate, regardless of their disabilities. The guides will be trained about the locations of barrier-free restrooms and narrow roads that are unfit for wheelchair access. Each tour group will also include medical support staff. Hajime Takano expects such tours will also offer opportunities to educate average people on the realities of living with ALS. “ALS has become widely known as an incurable disease, but the realities are seldom discussed,” he said. 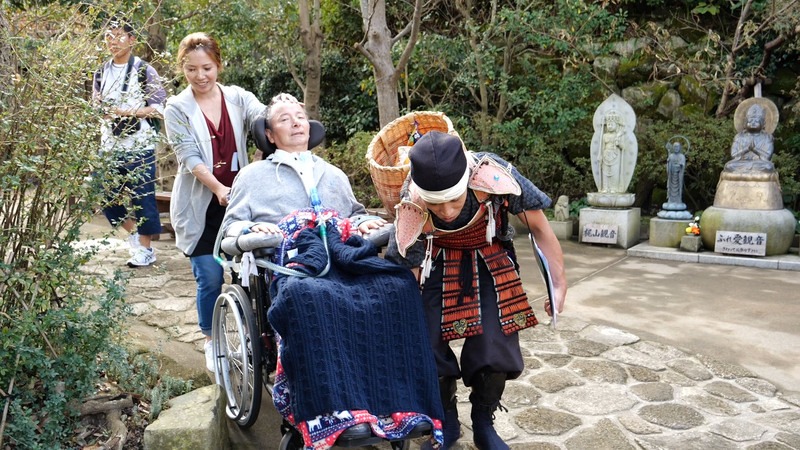 He believes that with the public’s help, people with ALS, who are estimated to number about 10,000 in Japan, can find new ways to enrich the quality of their lives. “I want people to know that with the support of society we can expand what we can do,” Takano wrote. How Do Your Staff Deal With Accessibility Enquiries?